What is Opal? Opals are a “mineraloid” because they do not have a crystalline structure like most minerals. Instead, they are originally deposited as a silica gel inside host rocks. What are the types of Opal? There are many types of Opal both precious and common. Some types that are often used in jewelry are White Opal, Black Opal, Boulder Opal, Peruvian Opal and Crystal Opal. What are Opal Doublets and Triplets? Opal Doublets and Opal Triplets are enhanced forms of natural Opal. A doublet is a thin layer of natural Opal that is glued on top of a dark backing to enhance the color and enlargen the stone. 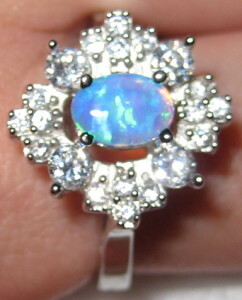 This also lowers the price because the amount of natural Opal within the stone is less. Triplets include even less genuine Opal. They are similar to a Doublet, but have a top layer of Quartz. Doublets and Triplets make the beauty of Opal stones more affordable, but they are susceptible to water damage that can seep in between the glued layers. What color is Opal? Opals are famous for their fire- vivid splashes of gorgeous colors in reds, oranges, yellows, blues and greens. Black Opals have a dark base while White Opals are… you guessed it…white, but both display multiple firey colors. A crystal Opal can be black or white, but it is more transparent than other forms. Peruvian Opal is aqua green or light pink and doesn’t have the same fire as its cousins. Where does Opal come from? The most famous and vibrant Opals come from Australia. In fact, Australia supplies the large majority of Opals, but other countries such as Mexico and the United States also have Opals. What are the metaphysical properties of Opal? Opal is thought to bring or enhance romantic love. They are also associated with prophecy. Opal is the October birthstone and is the gift gemstone for the 13th wedding anniversary. How do I clean and care for Opal? Opals require extra care as they are relatively soft and sensitive to temperature changes. Never use harsh cleansers, steam or ultrasonic cleaners. Opals do need humidity to retain their fire, so they should not be consistently stored in dry environments. In fact, it is helpful to soak SOLID Opals in water occasionally so they do not crack without humidity This is not true for Doublets and Triplets because soaking them in water can loosen their glue and allows for foggy spots! Opals can crack if they experience rapid temperature changes. Because they are relatively soft, they should be stored away from other stones that can scratch them. Solid Opals can be cleaned with warm water and mild soap, but Doublets and Triplets should be wiped with a damp cloth. As with all jewelry, take care not to strike it against a hard surface. What color is Onyx? Onyx is usally known as “Black Onyx” for jewelry, but Onyx in other colors, such as browns, whites and reds, is often used for carvings. These lighter colored Onyx varieties often have bands of color. Lighter Onyx is often dyed to create Black Onyx. Where does Onyx come from? Onyx comes from many locations including Brazil, the United States and India. What are the metaphysical properties of Onyx? Onyx is said to help change a person’s bad habits while improving intuition. It is the gift for the 7th wedding anniversary. How do I clean and care for Onyx? Because black Onyx is often enhanced, it is important to avoid ultrasonic cleaners, chemicals and water. Use a lint free polishing cloth to clean Onyx. As with all jewelry, take care not to strike it against a hard surface. What is Moonstone? Moonstone is a feldspar that shines with irridescent highlights called adularescence. What are the types and colors of Moonstone? Moonstone comes in a variety of colors and the types of moonstone are known by their colors such as Rainbow Moonstone and Peach Moonstone. 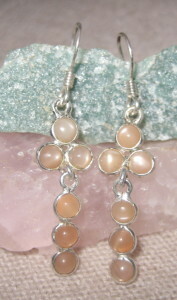 Moonstone can be transparent and translucent and comes in other colors including white, orange, gray and yellow. The adularescence always creates a blue or white shine on the stone. The clearer the stone and the bluer the highlights, the more valuable the stone. Where does Moonstone come from? Moonstone is found all over the world in countries that include the United States, Brazil, India and Mexico. What are the metaphysical properties of Moonstone? Because of it’s glossy moon-like shine, Moonstone has often being especially revered as a magical stone. Moonstones are said to bring good fortune and to balance yin and yang. In India, Moonstones are sacred. In fact, in the 1860’s, British Novelist Wilkie Collins penned a popular mystery called “The Moonstone” that told the story of a magical stone that was stolen from a shrine in India, but the “moonstone” in his novel was actually a Diamond. How do I clean and care for Moonstone? Moonstone should not be cleaned with steam or ultrasonic cleaners. Using a damp, lint-free cloth is recommended. As with all jewelry, take care not to strike it against a hard surface. Moonstone’s cleavage patterns and hardness of 6 make it slightly vulnerable to cracks. What is Marcasite? True Marcasite is related to pyrite (that is, Fool’s Gold). They have the same chemical composition, but different structures and form as different minerals. 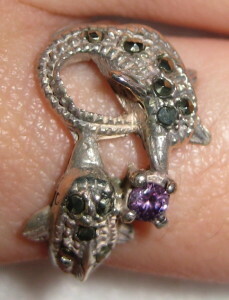 Technically, Marcasite is much too soft and crumbly to be used in jewelry. The stones that are labelled “Marcasite” in jewelry are actually iron pyrite. This information page will describe “Marcasites” that are found in jewelry so that you can understand the term when it describes jewelry items. What color is Marcasite? Marcasite as it is used in jewelry is dark, steely, metallic gray. It is usually faceted. Where does Marcasite come from? Marcasite is found all over the world including in Spain, Germany, South Africa and the United States. What are the metaphysical properties of Marcasite? Marcasite has been used in jewelry for hundreds of years, but it became very popular during the Victorian age and is now used in a variety of vintage-style jewelry. It is said to increase physical endurance and help improve mental clarity. How do I clean and care for Marcasite? Marcasite is relatively hard, but extra care is required due to the way it is set. Many settings use jewelers cement, so the stone can loosen when the cement is wet. Avoid chemicals, heat and water, especially hot water, and wipe your Marcasite jewelry with a slightly damp cloth. Be sure to wipe it dry with a lint free cloth. As with all jewelry, take care not to strike it against a hard surface. What is Malachite? Malachite is a secondary mineral that forms when copper interacts with carbonate or limestone. It is often found with other copper-derived minerals. What color is Malachite? 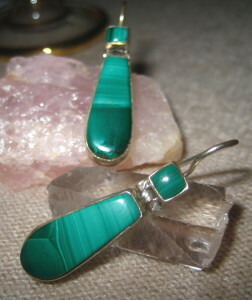 Malachite comes in a variety of green shades. It has banding and lines across it that are both lighter and darker green. Where does Malachite come from? Malachite is abundant and is found all over the world, including Zaire, Germany, France, Chile and the western United States. What are the metaphysical properties of Malachite? Malachite has been collected for thousands of years as a paint pigment and for ornamentation. It is said to promote protection from harm- including during childbirth. It also promotes emotional stability. Malachite is the anniversary stone for the 13th year of marriage. How do I clean and care for Malachite ? Malachite is relatively soft, so avoid harsh chemicals. It is often coated with a protective finish, so avoid steam and ultrasonic cleaners as well. Malachite is best cleaned with a soft, polishing cloth. As with all jewelry, take care not to strike it against a hard surface. What is Lapis Lazuli? Lapis Lazuli is not a pure mineral. Instead, it is a rock made up of a variety of minerals including lazurite, calcite and pyrite. What color is Lapis Lazuli? Lapis Lazuli’s color depends on the proportions of its minerals, but it is mostly deep blue. If it has a lot of calcite, it will have more white spots that bring its value down. Lapis Lazuli usually has streaks of gold pyrite. The more pyrite, the more valuable the stone. Where does Lapis Lazuli come from? The best Lapis Lazuli is usually from Afghanistan, but can come from other places around the world including Canada, Chile and the United States. What are the metaphysical properties of Lapis Lazuli? Lapis Lazuli has been used for jewelry and carvings for thousands of years. The Egyptians even ground it to use as eye shadow! It is said to help expand one’s mind, awareness and viewpoint. Traditionally, it was the birthstone for December. It is also the anniversary gift for the 7th and 9th wedding anniversaries. How do I clean and care for Lapis Lazuli ? Lapis Lazuli may be dyed and is usually covered with a protective coating. For this reason, avoid harsh cleaners, steam and ultrasonic cleaners. Lapis is best cleaned with warm water and mild soap. 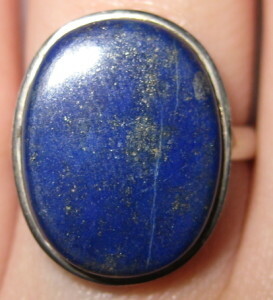 Lapis that is worn often may need to be polished regularly. As with all jewelry, take care not to strike it against a hard surface. What is Labradorite? Labradorite is a type of plagioclase feldspar that is also known as spectrolite. It usually comes from hardened magma. 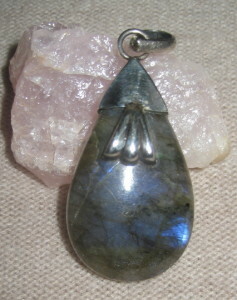 Labradorite is named for the Labrador peninsula in Canada, where it is often found. What color is Labradorite? Labradorite is many colors! The stone appears dark gray, but it is very irridescent. Depending on the angle, Labradorite shines with vivid blues, greens, yellows and even some oranges. What are the metaphysical properties of Labradorite? Labradorite is said to enhance a person’s strengths. It may remove negativity and anxiety, and encourage a positive outlook. How do I clean and care for Labradorite ? Labradorite can be cleaned with mild soap and warm water. Never use chemicals or ultrasonic cleansers. Labradorite can chip easily if you are not careful. As with all jewelry, take care not to strike it against a hard surface. What colors does Jasper come in? Unlike the clear Quartz we normally think of, Jasper is opaque and comes in a variety of earth colors and types. Sometimes, a piece can include a range of colors and designs. Jasper can come in reds, beige, whites, greens, tans, and more. It often has bands or crystalline circles of color. What are the types of Jasper? Some better known varieties of it include Ocean Jasper, Picture Jasper, Leopardskin Jasper, Poppy Jasper and Dalmatian Jasper. Where does Jasper come from? Jasper is found all over the world, including in many areas of the Western United States. It is also the state rock of Massachusetts. When we see it in jewelry, it is usually polished and shining. What are the metaphysical properties of Jasper? Jasper has been used for decoration for thousands of years, and some cultures believe it will drive away evil spirits. It is often found in scarab design jewelry both modern and from ancient Egypt. How do I clean and care for Jasper? Jasper is a durable stone that is easily cleaned. Unless is is dyed, you can clean it with mild soap and water, then polish it with a dry towel. 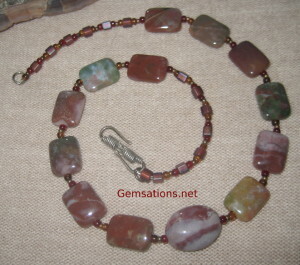 With dyed Jasper (which is uncommon,) you can dust it lightly with a dry cloth. As with all jewelry, take care not to strike it against a hard surface. What colors does Jade come in? We usually think of Jade as green, but it comes in many colors including red, yellow, green, lilac, black, orange, white, pink blue and brown! What are the types of Jade? There are two varities of Jade: Jadeite and Nephrite. Jadeite is rarer, with a hardness of 7 and produces the highest quality Imperial Jade. Nephrite comes in shades of green and has a lower harness rating of 6.5. This variety is commonly used for carvings. Where does Jade come from? Jadeite can be found in Japan and the United States. Nephrite comes from Russia and China. What is the history of Jade? Jade is a well-regarded stone, especially in China. It is often believed that the stone’s special essence can be absorbed when jade is handled. Legends say that Spanish explorers wore Jade amulets to prevent hip and kidney disorders. It is the US state gemstone of Alaska and Wyoming. What are the metaphysical properties of Jade? 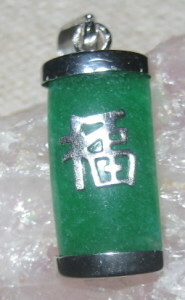 Jade has often been called the concentrated essence of love. It is the anniversary gift for the 12th, 30th, and 35th years of marriage. It is said that Jade brings relaxation, reduces negativity, and promotes longevity. How do I clean and care for Jade? Clean Jade with mild soap and warm water. Dry with a soft towel. Avoid high temperatures, harsh blows and cleaning chemicals. Where does Iolite come from? 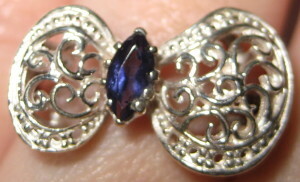 Iolite is found in India, Brazil, and Africa among other countries. The Vikings probably mined their Iolite from Norway or Greenland. What are the mystical properties of Iolite? Iolite can be used as a soul connector. It is also said to give accurate visions, release discord and strengthen the liver. It is the gift for the 21st wedding anniversary. How do I clean and care for Iolite? Iolite is pretty durable with a hardness of 7-7.5. You can clean it with an ultrasonic or steam cleaner. As with all gems, protect Iolite from chemicals and heavy blows. Shop our Gemsations store on Etsy! Shop the official Gemsations web store!